on Meridian. It has been repaired at least once. 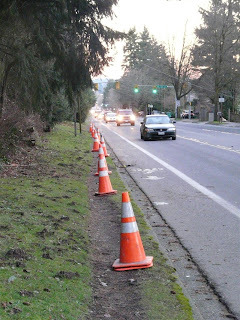 For almost as long as Shoreline has been a city, residents have been complaining about sidewalks. Every city survey has sidewalks as a high priority. 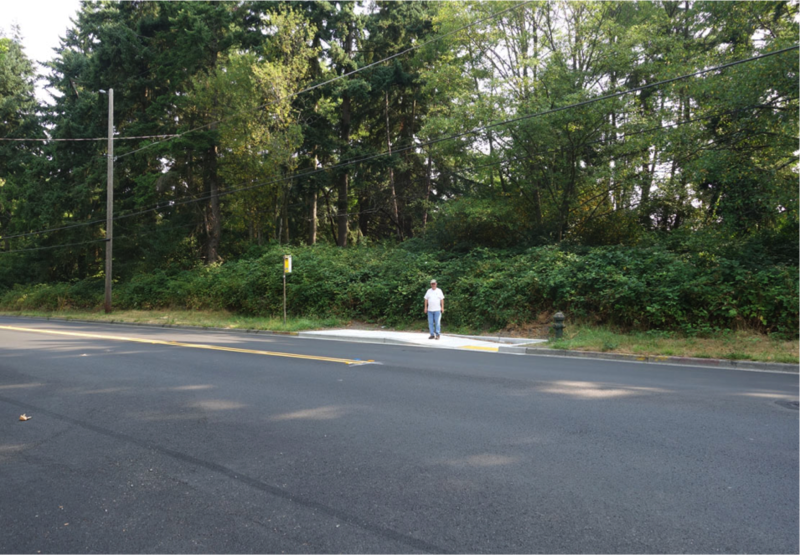 Anyone who has ever tried to walk in Shoreline knows about the intermittent sidewalks, with varying widths, cracks from tree roots, and telephone poles in the middle. Anyone with any kind of mobility issue, a wheelchair, or a baby stroller knows you "can't get there from here." Early city councils budgeted for new sidewalks and began a program to add sidewalks, as well as resurface all the city streets. A couple of things got in the way. China had a building boom and started buying raw materials, so costs went up. Then the recession hit and city spending was curtailed. It can cost up to $2.5 million to construct just one mile of sidewalk. The current city budget is $200,000 per year. At this rate it would take 500 years to complete all the sidewalks. 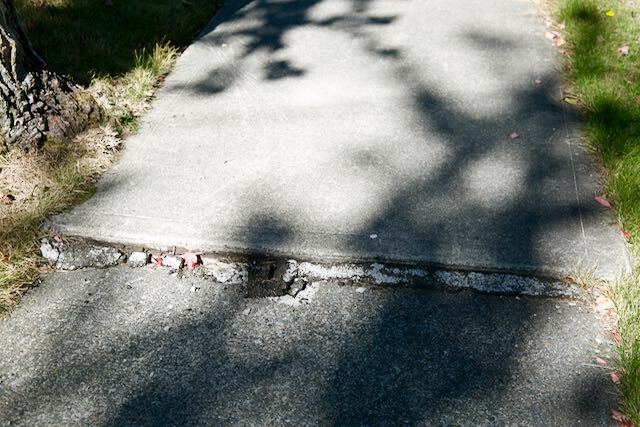 Residents have a strong preference for well built sidewalks that will last 50 years. 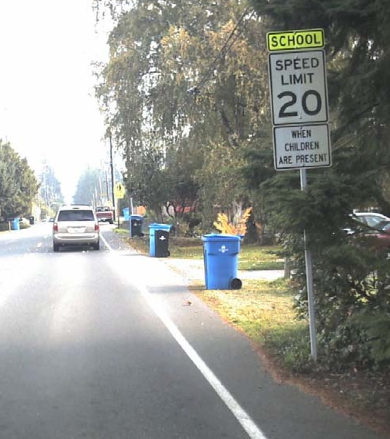 After 20 plus years as a city, it is excruciatingly clear that King county made terrible mistakes when it chose the wrong variety of street trees. The street trees are destroying the few miles of sidewalk that we do have. The roots crack and push up the concrete. Some sections have been repaired three or four times. It took the city a few tries to come up with the standard width for residential sidewalks. ADA requirements mean curb cuts need to be installed on every corner. The sidewalks are dangerous and represent legal liability for the city if someone is injured. Every year the budget has been spent trying to maintain the existing sidewalks. Developers were required to include new sidewalks with major projects. Federal funds were used for new sidewalks on Aurora and via the Safe Routes to School program. At this point, we have 77 miles of sidewalk, 11 of which are ADA compliant. The 11 miles represents 15% of the sidewalk network. Every council has wrestled with the cost vs the need. One of the problems is that the only funds available to the city are vehicle license fees, property taxes, and sales tax. In 2009, the council added a $20 vehicle license fee to pay for roads. However, every time a council got close to imposing a fee or tax hike to pay for sidewalks, residents became very incensed. Some of those residents were the same ones who complained about sidewalks. The councils would back off. The legislature's response was to grant city councils the ability to add as much as $50 to vehicle license tabs. When the Shoreline council lobbied the legislature last year for more money for infrastructure, they were told that they already had the ability to raise funds through license tabs. The Sidewalk Advisory Committee just wrapped up its work after a year of regular meetings and tours around the city. They created a "score card" for use in making decisions about where new sidewalks should go and use the score card to identify the areas of greatest need. They expressed a strong opinion that existing sidewalks should be maintained. At the June 4, 2018 meeting of the Shoreline City Council, the vote was 4-3 to add a $20 fee to vehicle license fees to maintain and repair existing sidewalks. The three who voted against were McConnell, Roberts, and Salomon. All agreed that something needed to be done about sidewalks but cited concerns about the financial burden on citizens, particularly in light of the state property tax increase of the last year. The increase will raise an additional $780,000 per year. The street tree was cut down after the sidewalk was repaired three times. The roots have cracked and lifted the curb and street as well. The effective date of the new fee is September 1, 2018. By state law, the additional revenue cannot go into effect until March 1, 2019. The Department of Licensing sends renewal notices up to 120 days ahead of the license renewal date. Residents would begin to see the higher VLF fee on renewal notices starting in November 2018, as the bills for March could be sent as early as this time. To pay for new sidewalks, the Council anticipates asking for a sale tax increase at a future date.